The Care Center here in Oklahoma is a child advocacy center with a goal of ending child abuse in Oklahoma County. One of the things they do is give a new stuffed animal to their patients after every appointment. 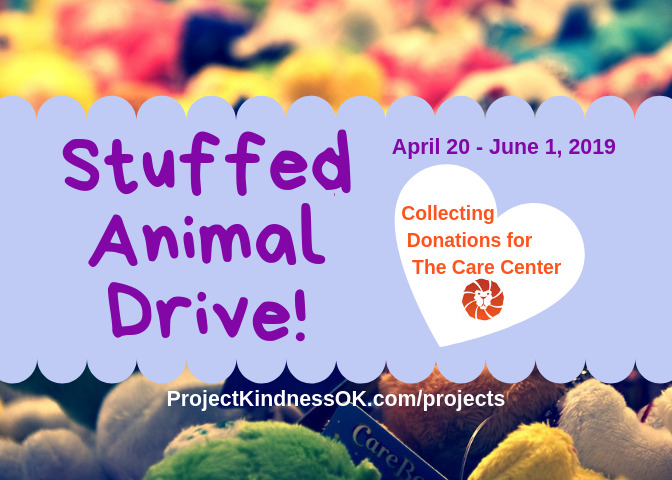 We're partnering with Project Kindness OK, an Oklahoma based community organization with the goal of giving everybody a chance to impact the community around them for the better, to assure that both their supply of stuffed animals and their patient's joy of getting them doesn't run out any time soon! We are collecting stuffed animals of all different sizes and types for all ages. The only requirements are that the stuffed animals must be new and still have tags on them. Other than that, it is totally up to you, so have fun picking them out! We will have a basket set up at Green Bambino to collect donations through June 1.